Number of searches of the term "Climategate" according to Google Trends. The second release of stolen e-mails, last month ("Climategate-2.0") didn't generate anything like the spike of interest of the first release ("Climategate"), in 2009. The so-called "Climategate" case of 2009 will remain in history as an example of a highly successful "spin campaign". It had a strong negative effect on public beliefs in global warming and trust in scientists and it played an important role in the failure of the Copenhagen climate talks. However, the public has reacted with a big yawn to the second batch of email messages released last month ("Climategate 2.0"). 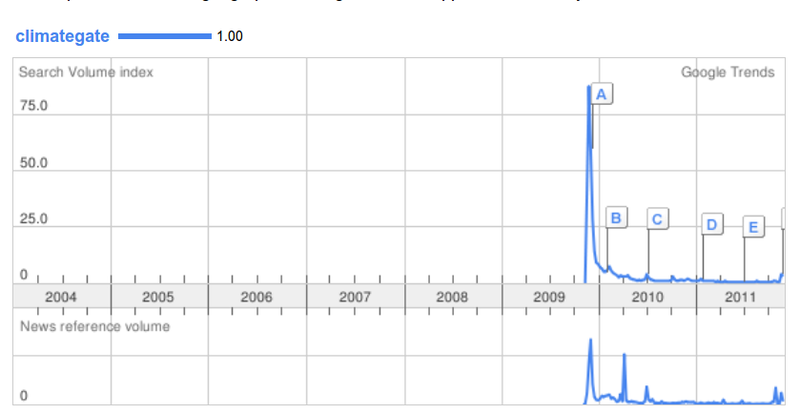 We can see that using "Google Trends" as shown above and also below. The modest spike that correspond to frantic attempts to ignite the interest of the public in Climategate 2.0 is nothing even remotely comparable to the giant spike of the first Climategate. Apparently in these things there holds the old say, "fool me once...." That is, it is very difficult to fool people twice with the same trick and, indeed, "Climategate 2.0" is turning out to be a big flop. The most recent polls indicate that concerns about global warming are climbing up again with the public and that's more evidence that you can't fool people forever. So, we still have a chance to win this battle. We need to keep fighting it. "You might, just might change your mind..... "
"The modest spike that correspond to frantic attempts to ignite the interest of the public in Climategate 2.0 is nothing even remotely comparable to the giant spike of the first Climategate. " Maybe, but the sad truth is that "climato scepticism" is clearly gaining ground in the US today (even if skewed in stupid ways like warming yes anthropocentric no), and it is also the official position of several Repub candidates. andyuk..no matter what you "believe" you cannot point to one ioata of actual proof of this theory. You might want to educate yourself into the facts surrounding the " climate cause" , or the PR battle .. There is still today not a single shread of evidence that mankind can alter the global climate..
Dear Vindicated, in Italy we have a say "No one can be more deaf than those who don't want to listen"
That's why "hammering" the peak oil aspect seems as the best "strategy"(or at least a key aspect of it) if there is one out of this mess. I am sure that they are mulling over this giant flop of their last trick, "Climategate 2.0". They are thinking that they have to invent something new, but what? I wouldn't want to be in their shoes! In the meantime we have just experienced the warmest La Niña year on record. The next El Niño, even if it's average, will probably bring a new record warmest year. It will be tough for the poor fake skeptics. But I'm sure they'll come up with something. They are not bothered by pesky little things like integrity and honesty. The goal justifies the means. « GINGRICH: But let me make a deeper point. There’s a core thing that’s wrong with this whole city. You said earlier that it would take too long to open up American oil. We defeated Nazi Germany, fascist Italy, and Imperial Japan in three years and eight months because we thought we were serious. And saying he will dismantle the EPA (environment protection agency) to replace it by an "environment solution agency" or something that would basically let anything go ..
That, too, shall pass. But it will take time.
" The next El Niño, even if it's average, will probably bring a new record warmest year." @Neven: let's wait and see. The next El Nino isn't due until 2013 and a lot of things (volcanoes) can happen in the meantime. The longer we have to wait for the next El Nino, the stronger it will be. Solar energy keeps heating up the tropical Pacific ocean. It has to flow through the atmosphere towards outer space sometime. Not all skeptics are poor and fake. There are eminent scientists that are branded as skeptics. Why PO would complicate the issue ? Are you thinking geoengineering, CCS and other non solutions ? PO can only help, only solution is to consume less fossiles, and high volume based taxes on fossile fuels are the best if not the only policy to accelerate necessary changes. Yves, unfortunately right now Peak Oil is making climate change much worse. The less efficient we are in using fossil resources, the more greenhouse gases we pump into the atmosphere. This is the real tragedy of our situation. And how peak oil is making ourself less efficient in fossile use ? Would say quite the contrary. But a pity that we don't oblige ourself to do more with higher fossile volume taxes. On the other hand peak oil induced collapse might well render us unable to extract and burn remaining coal or tar sands for instance. Yves, it is not using oil that is becoming less efficient; it is the production process. It is a question of EROEI. Lower EROEI forces the industry to spend more energy to produce the same amount of energy. Lower EROEIs mean higher CO2 emissions for the same amounts of energy produced. Right now, energy production is still increasing, but CO2 emissions are increasing much more. Ok but overall let's say PO was ten years ago, not much coal in the ground, clearly the picture would be better for AGW. The sad part is that the energy issue was avoidable. Either of the Integral Fast Reactor or Thorium-based molten-salt reactors (MSRs) could have supplied the world's demands for electricity and industrial process heat without carbon emissions, but we've delayed two (or four) decades and gotten ourselves into this mess. All because we let the fossil-fuel industry regulate its competition out of existence.